Gordie Mutch wearing Stilo ST5 CMR2007 kart helmet. Paint by Rennat Design.Stilo ST5F N KRT Composite Kart Helmet ST5F N KRT is a karting specific helmet which has a small, lightweight shell with an aerodynamic shape. The helmet interior is very comfortable and the visor provides an excellent field of view. Based on the popular ST5F N helmet, this new KRT (kart) version utilises all of the great features of the ST5 range of helmets including a lighter, smaller shell, increased vision with a visor which lifts fully out of line of sight, high levels of comfort, improved aerodynamics, better ventilation and uses a visor locking clasp which can easily be operated with just one hand. Also, the large size helmet now uses the small shell size which in turn means more competitors fit into the smaller, lighter and more aerodynamic small shell size. This Snell K2015 approved ST5F N KRT karting helmet comes without any side ports and without any fitted microphones or electronics. The removal of the side ports offer a sleeker more aerodynamic profile. 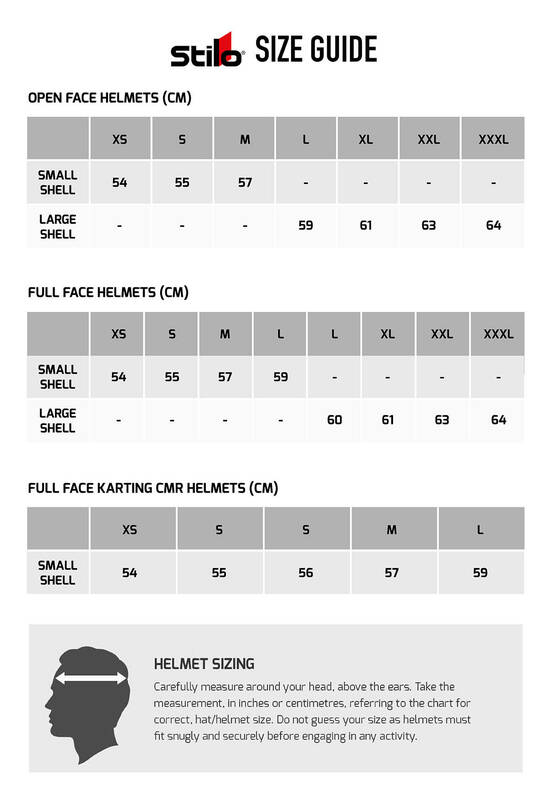 Inside, the helmet lining is similar to that of the ST5 CMR helmet and is not fireproof as this is not needed for kart racing. A full range of optional visors are available depending upon conditions, as well as a full range of spoilers and accessories.